Scientists at Washington University in St. Louis say they have developed a technique employing focused ultrasound and microbubbles to release brain tumor mRNA into the bloodstream that allows them to detect brain tumor biomarkers through a simple blood test. Hong Chen, Ph.D., a biomedical engineer, and Eric C. Leuthardt, M.D., a neurosurgeon, led a team whose proof-of-concept method permits biomarkers from a brain tumor to pass through the tough blood–brain barrier into a patient's blood using noninvasive focused ultrasound and some tiny bubbles, potentially eliminating the need for a surgical biopsy. Chen, assistant professor of biomedical engineering in the School of Engineering & Applied Science and of radiation oncology in the School of Medicine, said while researchers have already learned how to get a drug through the blood–brain barrier into the brain via the bloodstream, no one, until now, has found a way to release tumor-specific biomarkers, in this case, mRNA, from the brain into the blood. The researchers targeted brain tumors in a mouse model using focused ultrasound, a technique that uses ultrasonic energy to target tissue deep in the body without incisions or radiation. Similar to a magnifying glass that can focus sunlight to a tiny point, focused ultrasound concentrates ultrasound energy to a tiny point deep into the brain. Once they had the target, i.e., the brain tumor, the team then injected microbubbles that travel through the blood similar to red blood cells. When the microbubbles reached the target, they popped, causing tiny ruptures of the blood–brain barrier that allows the biomarkers from the brain tumor to pass through the barrier and release into the bloodstream. A blood sample can determine the biomarkers in the tumor. The blood test would reveal the amount of mRNA in the blood, which gives physicians specific information about the tumor that can help with diagnosis and treatment options. Results of the study (“Focused Ultrasound-Enabled Brain Tumor Liquid Biopsy”), which blends imaging, mechanobiology, genomics, immunology, bioinformatics, oncology, radiology, and neurosurgery, are published in Scientific Reports. “Although blood-based liquid biopsies have emerged as a promising non-invasive method to detect biomarkers in various cancers, limited progress has been made for brain tumors. One major obstacle is the blood-brain barrier (BBB), which hinders efficient passage of tumor biomarkers into the peripheral circulation. 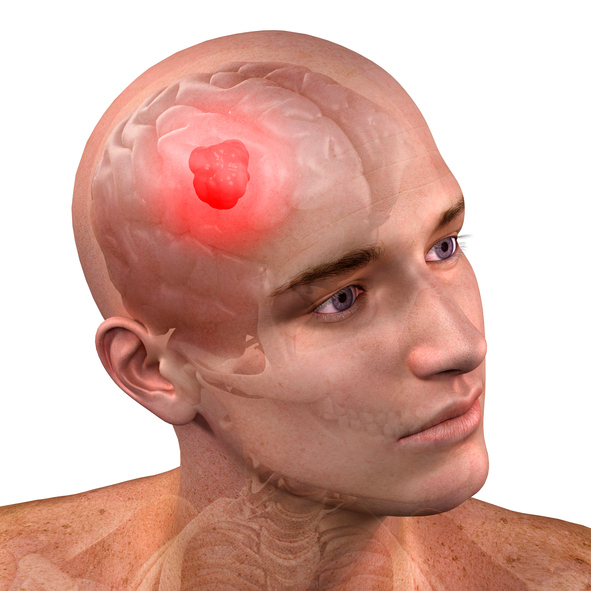 The objective of this study was to determine whether FUS [focused ultrasound] in combination with microbubbles can enhance the release of biomarkers from the brain tumor to the blood circulation. Two glioblastoma tumor models (U87 and GL261), developed by intracranial injection of respective enhanced green fluorescent protein (eGFP)-transduced glioblastoma cells, were treated by FUS in the presence of systemically injected microbubbles. Effect of FUS on plasma eGFP mRNA levels was determined using quantitative polymerase chain reaction. eGFP mRNA were only detectable in the FUS-treated U87 mice and undetectable in the untreated U87 mice (maximum cycle number set to 40),” write the investigators. This technique could lead to easier, more accurate diagnosis of brain tumors and methods to personalize braing cancer treatments, according to Leuthardt. In addition, Gavin Dunn, M.D., assistant professor of neurosurgery, a co-author and leader in cancer immunobiology, plans to use the technique with immunotherapy, which offers precision treatment that targets specific biomarkers in the brain. The team continues to work to refine the process. The future will require integration with advanced genomic sequencing and bioinformatics to enable even more refined diagnostics. “Our ongoing work is to optimize the technique and evaluate its sensitivity and safety,” Chen said.